We've all heard about "the talk" you have with an agent when you're considering an offer of representation. What about the talk when your stuff is ready to make the rounds of publishers? Could you kindly outline any suggestions about what to ask the agent about submission strategy, such as: how many will you submit to initially? Will you modify approach based on initial feedbac? How many total and when will you give up? How will you inform me about responses? Etc. Does that about sum it up? Any other snarkiferous suggestions would be greatly appreciated. Ok, hang on to your hats, this is going to generate a shitstorm. Your agent, who let's all just assume, knows what she's doing, will send your stuff out. Asking about submission strategy, numbers, how I'm going to do it, and all that other stuff, makes me nuts. It makes me nuts because it's like a committee where everyone has input of equal value, and there's a vote at the end on what to do. That is not the case here at Snark Central. It may be the case at other places. I'm not going to tell you how to dangle your modifier; you're not going to tell me how to dangle my fetching project du jour (even if you wrote it). Just let me do my job and judge the results. I'll report back with an offer, or after a month, which ever comes sooner. I'll always tell you where something is; I'll tell you what editors are saying if you ask. Parsing out what those editors say is a waste of time, but doghelpme, almost every client wants to do it. No is no, for whatever reason. Move on. My experience is that people who want to be involved every step of the way are a BAD fit for my agency. If you think this is how you'll be, you need to find out BEFORE you sign with an agent. If I had a conference with every client before I started sending his her work out, I'd lose a work day a week. Honest to dog, wouldn't you rather I DID the work than talk to you about it? We've had forty rounds on this subject earlier on the blog. It's simply a matter of style. Some agents love to yammer with clients about strategy. Good. Sign with them if you want that. Some agents prefer to bathe their clients in neglect until they get an offer; that's me. I'll tell you that upfront. I'll even make you say it's ok. You don't have to like it, but you do have to live with it. Now, the proviso here is that your agent knows what she's doing. No agent should EVER refuse to tell you where your work is. EVER. No exceptions. If you want cover letters, and rejection letters (or notes) you are entitled to get those promptly. I will send you every letter you want, and I'll mail you rejection letters till the cows come home. I just don't want to engage in endless conversation about it. Writers obsess about this stuff and it's extremely tedious and a waste of time for me. As long as the writer knows this, then there shouldn't be an issue. It's a style thing, a matter of fit. Are you open to suggestions, if a writer has an editor they'd love to have it sent to? Or is that off-limits completely. I know I'd want an agent that I could ask about editors, offer suggestions and just discuss strategy, so it's good to know that's something I should be upfront about before signing on. I don't object to this. 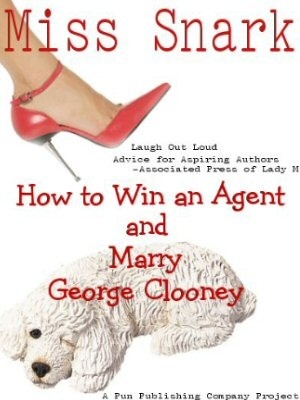 I want an agent to do these things. I do not know how to do them for myself. I don't want to know how. I want to know how to write well and entertain my readers. I want an agent who knows her business well. I want to be a writer, not an agent. Unless, of course, you have an incredibly high paying opening for a short woman with goats. It it just me, or are these verification codes getting longer and longer? Is that a sign I post too much? Sheesh, I know when I'm not wanted! I don't know--I think I'd like a briefing before everything starts, along the lines of this is where I'm submitting first, this is how long it'll probably take to hear back, and that sort of thing. But do I want daily E-mails telling me that she just re-worded her pitch? Not really. I asked this question. I don't want a daily progress report, but I wouldn't mind an overall plan of attack and reasonable updates along the way. My style, if I ever get to have one, on approaching editors is similar to Elektra's. I do want briefing on the D Day invasion; after that, forwarding cover letters and rejections, no other correspondence necessary, would be fine. I know in my case, not only would I like to have a little inkling, I have a husband who's been making most of the strokes around here while I've written. Believe me, he'll want updates from me on the status of his "investment." (No, he's not naive enough to think it'll be a best seller, but we would like to fix the fence some time in the next two years). It's not always the writers. They may get pressure from people attached to the them, who feel they have a vested interest, warranted or not. Your husband wants to fix the fence, my wife just wants a cleaning lady. Miss Snark, you're being quite reasonable in warning authors not to obssess. In the bigger picture, though, agents do have different submitting styles. Some love auctions, while others refuse to even consider doing them. Some even prefer exclusive subs. An author has to be comfortable with stuff like that (and needs to know it before signing with an agent). Miss Snark, I'm a bit surprised to hear you say that it makes you nuts when prospective clients ask how many subs you'll make before you give up. I want to know ahead of time if an agent plans to throw up her hands after the first five publishers turn down my manuscript. Or did I misunderstand something here? Maybe it's just the number and depth of questions that sends you to the gin bucket. That makes sense.